Mission: Impossible—Rogue Nation with Tom Cruise, reviewed. Tom Cruise’s mission, should he choose to accept it: Keep making action movies forever. Tom Cruise in Mission: Impossible—Rogue Nation. Is Tom Cruise the first person in human history to find a loophole in this whole “mortality” scheme? Between his long association with Scientology (documented chillingly in Alex Gibney’s Going Clear) and his by now bizarre ability to keep playing physically demanding action parts into his 50s, it’s beginning to look that way. 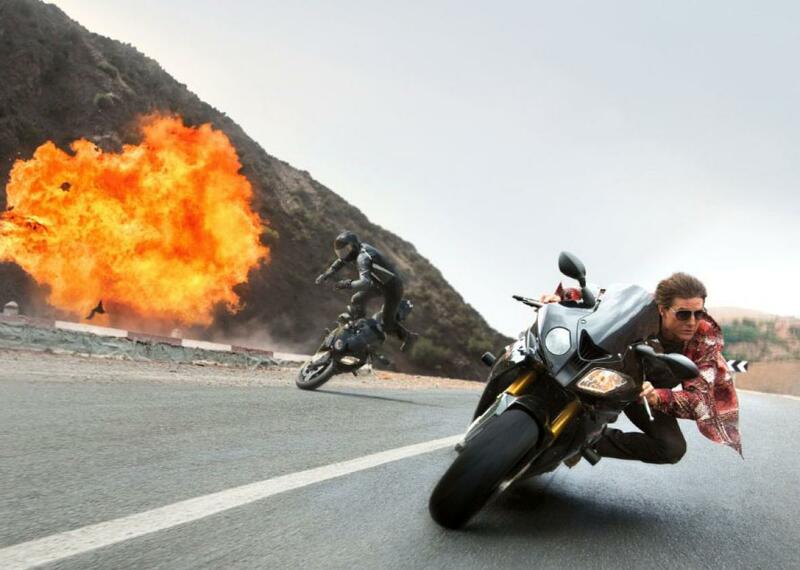 Mission: Impossible—Rogue Nation is Cruise’s fifth outing as the superspy Ethan Hunt over a period of nearly 20 years. None of the Mission: Impossible movies were directed by Cruise, but he is in some important sense the author of all five. It was his production company that acquired this old Paramount property—a long-running 1960-’70s TV series—and Cruise has handpicked the director for each project, choosing from a classier rung of names than your run-of-the-mill action producer can afford: Brian De Palma, John Woo, J.J. Abrams, Brad Bird. This time out, the writer/director is Christopher McQuarrie, who wrote The Usual Suspects and also wrote or co-wrote several earlier vehicles for Cruise: Valkyrie, Jack Reacher and Edge of Tomorrow. Perhaps more than any of the M:I directors so far, McQuarrie understands the unique properties of this singular movie star—his ascetic intensity, his sometimes-scary moral certainty, his always-scary drive to excel. The result of their collaboration is a briskly paced and witty reminder of why we go see summer action movies in the first place: to watch Tom Cruise hanging from the locked door of a plane as it takes off, the ground receding far below him as Simon Pegg and Ving Rhames frantically try to hack into the aircraft’s computers and open the door. As anyone familiar with Cruise’s Ethan Hunt knows, he is not James Bond, nor was meant to be. In fact, unlike Bond—a character who outlasts the actors that play him, his catchphrases and drink preferences persisting intact through each successive incarnation—Ethan Hunt is impossible to imagine played by anyone but Tom Cruise. Rogue Nation knows this as well as any of the Mission movies have ever known it, and the script plays slyly on Cruise’s Teflon-like imperviousness to time, change, or harm. Major plot points hang on other characters’ flatly stated belief that Hunt is capable of accomplishing literally anything through sheer force of will—that he is, in the words of Alec Baldwin’s awestruck CIA bigwig, “the living manifestation of destiny.” Humans can only survive for about two minutes without oxygen, warns Ilsa Faust (Rebecca Ferguson), a Swedish national working undercover for British intelligence, as she lays out the plan for a complicated underwater heist. But Ethan’s longtime IMF colleague Benji (Pegg) intervenes to clarify: given that he’s Ethan Hunt, she can surely tack on another full minute. Cut to Cruise’s face, looking momentarily dubious but resolute. The IMF in question here is not the International Monetary Fund—that would be a very different thriller—but the Impossible Missions Force, a secret governmental entity tasked with the solemn duty to … do stuff that can’t be done. In this case, that’s tracking down Solomon Lane (Sean Harris), the head of a shadowy organization known as the Syndicate that mobilizes terrorists the world over in pursuit of its own vague, but definitely evil, aims. (To the extent he’s given a motivation at all, Lane seems intended as an extreme extrapolation of Julian Assange, an anarchist ideologue who sows disorder for the purpose of destabilizing “the system.”) Ethan is convinced he can find Lane and stop him before he himself is killed by either Lane’s henchmen or the U.S. agents who have been authorized to shoot him on sight (because he’s gone rogue and taken matters into his own hands, what with being Ethan Hunt and all). Eventually joining Ethan, Benji, and Ilsa on their frenetic world tour (London! Vienna! Casablanca! Minsk!) are co-IMFers Brandt (Jeremy Renner) and Luther (Ving Rhames), whose belief in Hunt’s infallibility is tempered with a touch more practical realism than Benji’s. The four men craft plans and trade barbs in various hastily procured safe houses, while Ilsa’s true loyalty remains in question. Rogue Nation’s story is thinner than the diaphanous yellow silk gown Ilsa wears to the Vienna Opera in one of the movie’s first big action sequences. (During a performance of Puccini’s Turandot, an attempted political assassination turns into a spectacular catwalk standoff.) But it doesn’t matter. The suspense is tight and the action stunningly staged—especially that underwater sequence, in which Cruise has three minutes (because he’s Ethan Hunt!) to open a vault in a vast underwater chamber while the heavy metal arm of a machine sweeps around in a circle, nearly carrying him off every time it passes. The affectionate bickering among the IMF squad makes for good fun, and Ferguson’s character does more than her share of plan making, comrade rescuing, knife fighting, and motorcycle riding on embankments so steep the rider’s body is almost parallel with the ground. Ferguson is a classic beauty with the high, curving cheekbones of Ingrid Bergman, and Joanna Johnston’s costumes miss no opportunity to show off her powerfully fit body. But Ilsa is a more substantial character than your basic spy-movie bimbo in distress. Far from existing only as a romantic foil for Cruise’s character, she never even lets him get to first base. Not that he tries that hard—compared to the Ethan Hunt of some earlier installments, McQuarrie’s version is something of an asexual, duty-bound Boy Scout. I have no idea how Rogue Nation’s stunts were done or by whom, but it’s clear some real human bodies put themselves in apparent grave danger to keep us entertained on a hot summer afternoon, and I thank them for their sacrifice. At least one of those bodies belonged to Tom Cruise, whose 53-year-old mortal coil has been through a lot since it slid into view in a pair of tighty whities and a button-down in Risky Business. To see Cruise shimmy up a pole upside down while handcuffed, or swing to safety on a stage curtain, Errol Flynn–style—to watch him generally comport himself like a full-on, balls-to-the-wall action hero—is to be reminded of how much really can be accomplished through sheer force of human will. But eventually I asked myself: How long can this go on? If the Mission: Impossible series continues for another installment, maybe we’ll finally see Ethan Hunt and the man who makes him possible face the ultimate villain: time.